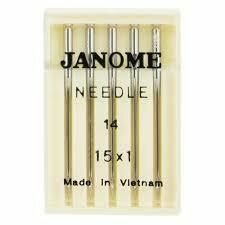 choose the needle size for the weight of fabric and weight of thread.
. Needle Sizes: *Keep an assortment of needles on hand to make it easy to choose the appropriate needle for each project. Check the needle plate, bobbin case and hook often. Any small imperfections may snag the thread as it passes and cause breakage. • Clean the machine often.